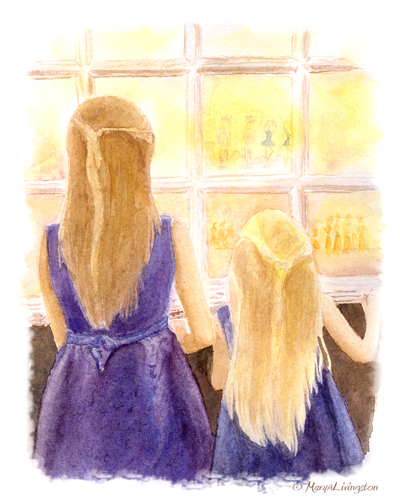 This entry was posted in Art, Bliss Tips, Child's perspective, Illustrations, Planting Seeds, Reflections, Uncategorized and tagged Art, ballet, bliss, Christmas, dancing, Family, gifts, Grandchildren, The Nutcracker, Watercolor by MaryALivingston. Bookmark the permalink. I showed the girls the picture this morning, they squealed…”That’s from the ballet with Nana and Papa!” They will always remember. My youngest granddaughter loves to dance also and her birthday is in December. Since she was about 4 I have taken her every year to see the Nutcracker for her birthday, and she loves every minute of it. This is something her and I share together and it makes her feel special. My wife reminded me last night that we are making memories for the children. But we also make memories for our selves. What could be better? So true, and those memories have incredible staying power. My oldest daughter danced in the nutcracker for many many years. Each year, her company had to dance in school performances and the public performances. A total of about 10 each year. I sat through every one of them and also took pictures. lol We also had gone to the nutcracker every year before she began dancing in that company and even years after. We are not able to go together now because she is in another state. Those were beautiful memories. I loved your story and love your picture even more. Beautiful words and a beautiful painting. Mary, You’ve spoken a meaningful post here – memories are the best and this is one of the best. Thank you, Virginia, and thanks for stopping by. Really enjoyed this, Mary! Yes, you both hit a home run with this gift to your grandchildren! Beautiful Picture! A memory we will always cherish. You are such an amazing writer Mary. Thank you so much. Thank you! Hard to miss when painting wonderful subjects like our grandchildren. For those of you who do not know, Lynette, is Nana of Nana and Papa. I am so thankful that my 3 beautiful grandchildren have both a Nana and a Grandma. Loved this so much! Thanks for sharing a special pre-Christmas outing. I enjoy seeing my niece perform in the Nutcracker. It is magical. Your art is also! Thanks for liking and commenting on my latest blog post. I appreciate that very much. A precious memory … thanks for sharing. What an awesome post. I share with you in the joy of Grandchildren and I can hear the little one’s voice through my own Grandchildren. Your painting is precious; a gift in itself. Thank you so much, your comment means a lot to me. I just popped over to your blog, very nice. I am new to watercolor, and enjoy following those with more experience. Your work is beautiful. Thank you, you are so kind. Perhaps it is the years of life coming through. Your post brings back fond memories. The first ballet my parents took me to was “The Nutcracker”. We took my niece to the ballet when she was five and taking lessons. For several months, everytime she heard a classical piece she declared, “that’s Swan Pond!!!”. Now her daughter is old enough, and we plan to take her to the ballet this Christmas. Thanks! “Swan Pond” love it! So special for a family to begin traditions. Memories like this are priceless.